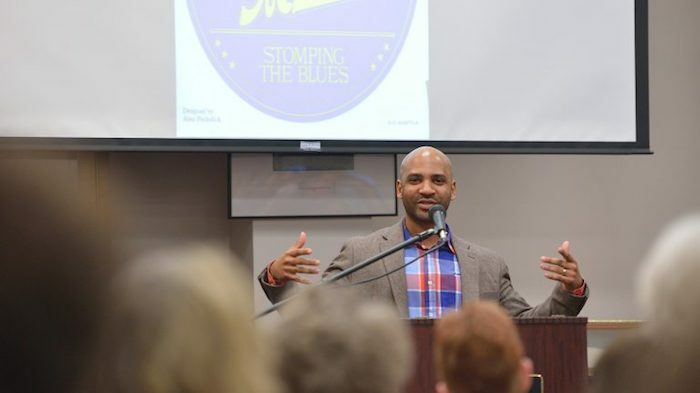 The University of Mississippi Graduate School has honored Derrick Harriell, assistant professor of English and African American Studies, for his contributions to inclusivity in education. Harriell, who also directs the university’s Master of Fine Arts in Creative Writing program, is the recipient of the Excellence in Promoting Inclusiveness in Graduate Education Award. Through his teaching in the undergraduate and graduate levels, Harriell ensures that he includes materials in his lessons that spark conversations about historically overlooked and marginalized communities. The professor was recognized during the Graduate School’s hooding ceremony Friday (May 11) at the Gertrude C. Ford Center for the Performing Arts. The university’s graduate program is widely publicized through word of mouth by successful students and through social media recruitment, Harriell said, adding that he wants prospective students to know their opinions will be valued. “I’m committed to our diversity and inclusiveness goals and maintain a heightened awareness of how we can always work to better attract the brightest graduate students from all over the world,” he said. “This recognition is really one for our students and our fine M.F.A. faculty here at the University of Mississippi. Beth Ann Fennelly, English professor and the university’s previous M.F.A. director, built an inclusive program to attract students from around the world to study creative writing, said Ivo Kamps, chair of the Department of English. Harriell has continued to build on that foundation, he said.